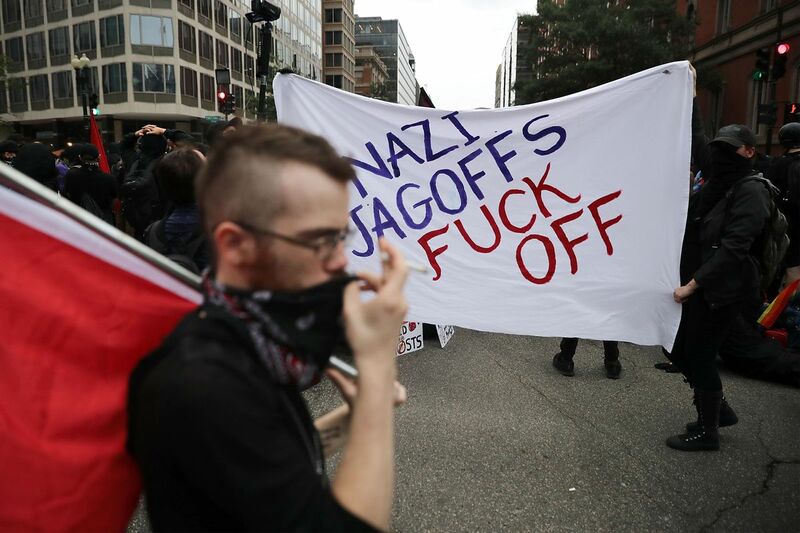 Antifa says it fights fascists and neo-Nazis. But this weekend, members attacked cops and journalists. Counterprotesters and members of antifa and Blac Bloc rally on the east side of the Eisenhower Executive Office Building as the white supremacist Unite the Right rally is being held across from the White House August 12, 2018, in Washington, DC. Demonstrators also clashed with journalists in Charlottesville, Virginia, on Saturday, during an event marking the one-year anniversary of the killing of Heather Heyer by a Unite the Right participant at the first rally. This is not the first time antifa protesters have been violent. In August 2017, about 100 anarchists and antifa members assaulted far-right demonstrators who were marching peacefully in Berkeley, California, with pepper spray, water bottles, and direct physical assault. Antifa supporters worry that if these groups’ views aren’t completely robbed of any kind of platform, they could gain legitimacy — and take advantage of democratic ideals like free speech to, ironically, promote their undemocratic messages. Violence is one way to get them off the stage.